The Wild got in one final off-day practice Tuesday before packing up and heading to Winnipeg for Wednesday’s Game 1 of the playoffs. Though defenseman Jared Spurgeon is still waiting to be cleared to play in the opener at Bell MTS Place, he did practice on a power-play unit, paired at the point with Charlie Coyle. Coyle took off the yellow practice jersey he normally wears as part of a line with Matt Cullen and Jordan Greenway, swapping it for a black defenseman’s jersey for a long work session on the power play. 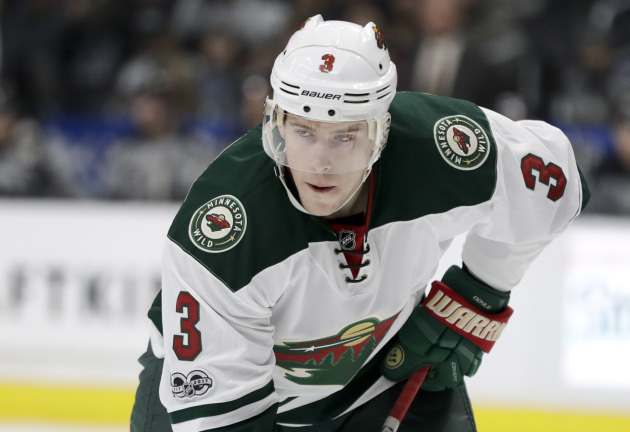 He and Spurgeon played up top with Eric Staal, Jason Zucker and Nino Niederreiter down low. The catalyst for that combo, coach Bruce Boudreau said, was to try and make use of Coyle’s wicked shot. “He’s a right-handed shot that we believe deserves to be on the power play,’’ Boudreau said. “We had to find a spot for him, because the other six spots were pretty well filled when Zach (Parise) got back. We thought it would be a good fit initially for a lefty-righty combination in that situation; right now, it’s a righty-righty with (Spurgeon) there if he plays. Coyle said Tuesday’s practice helped him settle into the role. He’s occasionally played the point before, but he needed a refresher to get comfortable again. “It’s a little different, but I like trying something new,’’ Coyle said. “I’m getting used to it. That’s all it is, is getting reps in. I haven’t played there a whole lot, but I’ll get a few practices in, and that will help me out. Boudreau said Spurgeon “is getting better,’’ and his playing status will be a game-time decision Wednesday. Spurgeon felt good after his second full practice, though he said he has not received medical clearance to play. Fans huddled into Bell MTS Iceplex in Winnipeg to catch the team's last bit of prep for the Wild ahead of the first playoff game in Winnipeg since 2015. Although the Jets have plenty of insight on the Wild from their matchups in the Central Division this season, center Paul Stastny's history with the Wild goes back even further. His first playoff series in the NHL was against the Wild in 2008 when he was a second-year player with the Avalanche. Stastny also suited up against the Wild for a postseason game last year against the Blues. St. Louis took that series in just five games, but Stastny doesn't feel what hapepned in that battle is applicable to the Jets' situation. "Everything is so unpredictable, and last year I only played one of those," he said. "I missed the first couple of games with injury, so I came back. It’s always tough. It’s always a good challenge playing those guys, and they’ve been in the playoffs for so many years in a row now. You know it’s going to be a grind from the first puck drop to the last one. We know it’s going to be a challenge, and we’re ready for it."